The Cantonese name for walnut is hap toh. Hap means whole or entire while toh sounds like peach, which symbolises longevity. The word toh is also part of the word toh fah or peach blossom, which stands for love and happiness. Walnuts make auspicious gifts at Chinese New Year, as they are synonymous with wishing the whole family happiness and longevity. Sift flour and baking powder into a large mixing bowl. Add salt and mix well. Gently rub butter into flour until mixture resembles bread crumbs. Gradually sprinkle a few spoonfuls of water and continuously mix until it forms a soft dough. Do not over-knead the dough. Roll into a firm ball, wrap in cling wrap and allow to rest for 15 minutes. Unwrap dough by spreading the cling wrap out onto a worktop. Cover with another piece of cling wrap so that the dough is in between, then roll pastry out to about 3/4 cm thick. Peel off top layer of cling wrap, slip your hand under the bottom layer and lift pastry off the worktop, then carefully turn it over to place pastry over greased tinfoil base. Remove cling wrap layer. Ease pastry into the base and up the sides of the tray. Press gently to get rid of air pockets but do not stretch the pastry. Trim off excess neatly. Loosely cover pastry with cling wrap and chill in the fridge for about 15 minutes. Melt butter on medium heat for 1 to 2 minutes in a microwave oven. Stir to ensure butter is evenly melted. Lightly whisk eggs in a large mixing bowl. Add sugar, honey, salt and vanilla. Whisk to combine well. Slowly drizzle melted butter into the egg mixture while briskly whisking to combine all ingredients. Mix in walnuts. Take chilled pastry out of the fridge, remove cling wrap and pour filling in. Level out the surface and ensure walnuts do not stick out of the surface too much. 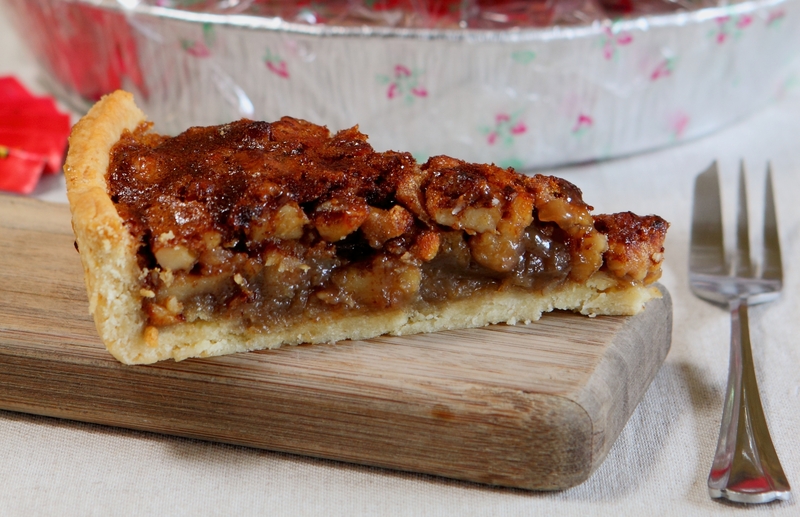 Bake walnut tart on the lowest shelf at 180°C for 30 to 35 minutes. When cooked, insert a wooden skewer into the filling; it should come out sticky but not wet and the crust should be golden brown. Remove from the oven and cool on wire rack. Keep overnight before serving either chilled or at room temperature. Prepare a 20cm round greased tin foil tray for the short crust pastry.